Are you a power kite beginner and wondering about kite safety? The following bunch of tips should give you a feel for the relevant safety issues. For this page, I'll use the term power kite to mean any flexible kite used for stunt flying or traction. By stunt flying I mean making the kite fly big shapes in the air while you stand still and control it. In the case of traction, that means the kite is pulling you along. For example in a buggy over the sand or on a surf board in the ocean. The old saying still holds true. 'When in doubt, read the instructions!' Kite safety is no exception. Look for a sticker on the packaging or a printed slip which gives kite safety warnings and flying tips. Definitely worth spending a few moments to read. It's a great idea to start flying a new kite in fairly light winds, until you are used to it. That way you'll feel more in control when you take the kite out in stronger or gustier conditions. This could apply to stunt or traction kiting. You might even decide to get a small trainer kite first, to have a bit of fun and get the hang of flying a parafoil in a range of conditions. Choose the right kite, not too big for the wind conditions you expect to fly it in. Whether shopping on or off-line, it's easy to get advice on this point. Apart from asking the shop owner, you can just hang out in a relevant forum online to get some answers. Kitesurfing safety advice is easy to come by, this way. Forums where you can find land kiteboarding safety advice or advice for stunt flying might be a little harder to find. I can remember seeing a news article where a young guy went out stunt flying with a large power kite. In a gale! He got picked up by a gust and dumped many meters away, and was fortunate to survive. This kite safety issue is just common sense really... 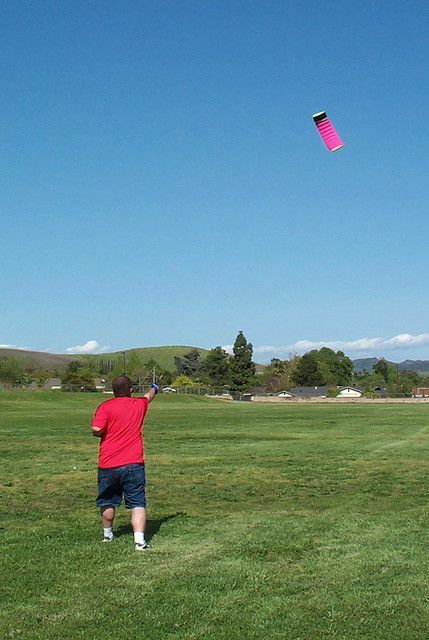 Fly your new kite in a large enough area, away from obstacles, including other people. In the case of stunt flying, imagine the full extent that the kite might arc to the left or right. Make sure there's nothing there but flat ground. Can you imagine someone getting whacked in the ear by a fast power kite? Or the Spectra lines doing an egg-cutter thing on someone's pet dog? I've read about a Flexifoil Stacker that was claimed to have hit 160 kph! Is that fast or what. Wear safety gear if you are getting dragged over the ground, for example in buggying. Protect yourself from getting scratched and bruised when you come unstuck in a fresh breeze. Maybe a bush leaped out and got you. Or you didn't react quick enough to a big gust and you end up sliding across gravel. On the topic of kite safety gear, a helmet is sometimes recommended for kite surfing in the ocean. Most images you see on the Web show people kite surfing without helmets, but in strong conditions it's possible to hit the water hard. At high speed, water isn't soft any more, and it is possible to get injured. Some kiting helmets are pretty minimal and don't look anything like motorcycle helmets, and yet offer useful protection. Of course, when traveling over hard ground, that's an even better reason to use a helmet! If you use a kite harness, a safety release system allows you to detach from the kite in an emergency. For example, if you are about to hit a hard object. Or if a huge gust threatens to turn you into an unwilling paraglider pilot! Also, if you are using a fully-depowerable kite, it's quicker to just drop the bar and get out of trouble that way. Think about getting kite instruction before getting into the more advanced extreme sports. It costs a bit, but results in fewer hassles and a smoother entry to the thrills of traction kiting. Actually, by being less likely to damage your kite, you might even save a bit of money in the long run!